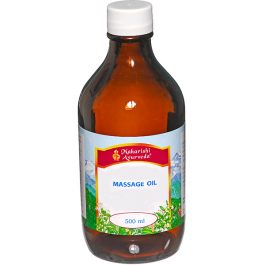 Daily oil massage improves circulation and strengthens immunity. This oil is rich in warming herbs that that have a stimulating and cleansing effect. Our light, fragrant Aroma Massage Oils offer the benefits of the daily self-massage and the healing scents of therapeutic aroma blends at the same time. The perfect choice for the days you're feeling the effects of day-to-day stress, these blends are formulated by skin type and are designed to nourish and balance the emotions. They help relax frayed nerves and keep the mind alert, focused and calm. Warm the oil to body temperature and massage onto the whole body for 3-5 mins. Preferably allow 15 mins for it to be absorbed before washing off. If time does not allow a full body massage focus first on the head and soles of the feet. 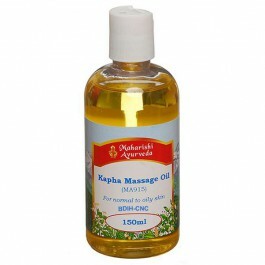 Ideally use Kapha Hair Oil for the head. Emollient & demulcent. Useful in reducing Kapha related skin problems. Relaxes muscles, nourishes the skin and enhances complexion. Normalises body temperature.